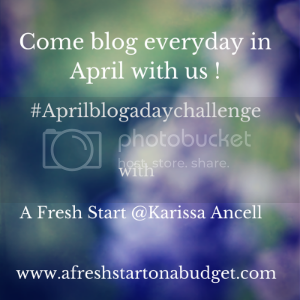 Welcome to another day of my April blog challenge. It’s a week into April already. I hope you’ll link up your own post so I can check out you and your blog. Today I want you to share 3 bloggers you wish you could meet. This topic is so easy that it’s actually hard, what I mean is there are so many bloggers that I love and want to meet that narrowing it down to just 3 is going to be the tough part. 1. Alex Beadon: Alex is so much more than a blogger. she does weekly videos where she teaches aspiring bloggers and entrepreneurs like me so much. I’d love to be able to meet her someday. 2. Neely from A Complete Waste of Makeup: Neely was one of the first bloggers I really started following. We are close in age but she is a newlywed and I’ve been married forever. We have talked on the phone and online but with her in Texas and me in California I’ve never met her, maybe one day at a conference. 3. Erin from Living in Yellow: I think Erin and I would get along really well. I love her blog and she seems like a ton of fun. She seems bubbly and always having a good time so I think it would be so fun to meet her. So what bloggers would you like to meet?